Main Street in Ellicott City officially reopened Saturday morning, recovering from the July 30 flood. 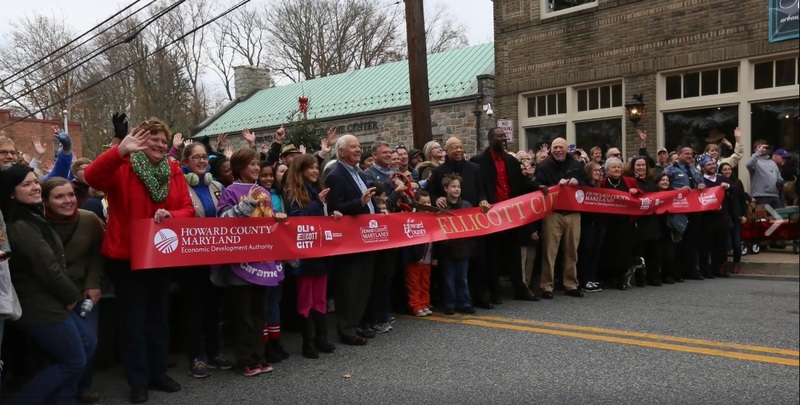 Main Street in Ellicott City had its official reopening Saturday, recovering from the July 30 flood. MARYLAND A WINNER: Michael Sanderson of Conduit Street alerts us to an article in the New York Times that focuses on state demographics and college graduates. It finds a general trend of newly college-educated workers moving southward and toward the coasts, and away from the more inland sections of the country. Maryland is noted as among the “net winners” in the analysis. BLACK CAUCUS PLANS PUSH: The Legislative Black Caucus is planning a more aggressive posture in 2017, determined to push back when needed against the administration of Gov. Larry Hogan, the election of Donald Trump as president and what caucus members see as continued inequities for the state’s African American residents, reports Ovetta Wiggins for the Post. COLLEGE AUDITS: Two state audits found that Towson University was more generous with scholarships than it should have been, giving at least $123,500 in tuition breaks that weren’t deserved over three years and the University of Maryland, Baltimore County sidestepped requirements to bid out work by hiring vendors through a standing maintenance contract, Tim Prudente reports in the Sun. HATE CRIME HOTLINE: Dennis Foley of WTOP-AM reports that Maryland’s attorney general has established a hotline for reporting hate crimes following a national spike in such crimes as vandalized churches and homes. In a statement, Brian Frosh said that conduct motivated by such factors as a victim’s race, religion, national origin, sexual orientation and disability is already illegal. FRACKING BAN: In the first of a series on expected happenings in the 2017 Annapolis legislative session, Daily Record reporter Bryan Sears writes that the fight to ban fracking is headed to the Maryland General Assembly. Again. Lawmakers and environmental activists are expected to head to Annapolis and the 2017 General Assembly session seeking to ban the controversial natural gas extraction process before a moratorium expires next fall. OVERTIME RULING: A federal judge’s 11th-hour ruling that blocks new overtime pay rules means Maryland employers can keep the status quo and drop their frantic rush to meet the Dec. 1 regulations, labor and employment law experts said Wednesday. Anamika Roy of the Daily Record reports that they added, however, that the ruling by a Texas judge nonetheless is likely to cause confusion for many employers who already had reclassified employees and set up computer accounting programs to track hours and comply with the federal rules. GOOD & BAD HOGAN: Political pundit Barry Rascovar, in a column in MarylandReporter.com, writes that when it comes to Gov. Larry Hogan, he gives us good news — like the decision to replace the aging and dangerous Harry W. Nice Memorial Potomac River Bridge but then gums it up by refusing to work with Democrats on this important construction project. A FAMILY’S STORY: The Post’s Arelis Hernandez writes about a family who escaped Honduras — first the father, then a decade later his wife and children — and settled in Montgomery County after crossing the border illegally. What becomes of them now that Donald Trump is slated to take the oath of the presidency? ZONING REMARKS AS ART: Bill Turque of the Post highlights a lighter — and deeper side — of a bureaucrat within the Montgomery County government offices. Zoning attorney Jeffrey Zyontz underscores his legal conclusions with footnotes that mix philosophy and humor, drawing on George Bernard Shaw to poke at a too-vague economic analysis (“If all economists were laid end to end, they would not reach a conclusion”) and Kahlil Gibran when he believes a developer has overstated the cost of a project (“Exaggeration is truth that has lost its temper”). SHA PREPS FOR WINTER: As strong winds recently whipped through Washington County, some State Highway Administration workers were on the road preparing for winter storms, Mike Lewis of the Hagerstown Herald Mail writes. For Washington County, SHA has stockpiled 20,250 tons of salt, 53,000 gallons of brine and 600 tons of abrasives and aggregates. HO CO SCHOOLS LAX ON OPENING RECORDS: The Howard County Public Schools system delayed, denied and otherwise made it difficult for some residents to obtain documents and data under the Maryland Public Information Act, according to a preliminary report from the state’s public access ombudsman, writes Bryan Sears of the Daily Record. But it’s unclear if the incidents outlined in the preliminary report represent a pattern or occasional lapses in the district’s compliance with the state’s open record laws. FAKE NEWS SNARES DELEGATE: Del. Aruna Miller (D-Germantown) on Wednesday said she alerted Montgomery County police to a hate letter that was allegedly left on a Muslim resident’s door. Miller said a photo of the letter was sent to her by a Germantown constituent who said they had received the photo from a man in Maryland. But, writes Andrew Metcalf for Bethesda Beat, the photo is an exact copy of one that has been circulating around the country and that Snopes.com has called into question. MINIMUM WAGE IN MO CO: Montgomery County Executive Ike Leggett wants a county council committee to rewrite a bill that would increase the county’s minimum wage gradually to $15, according to a memo he sent council President Nancy Floreen Tuesday that was reported on by Doug Tallman of Bethesda Beat. “I am concerned about the county being put in a competitive disadvantage relative to our neighboring jurisdictions,” Leggett wrote in the memo. FINAL DAYS FOR HAPPY HOUR: Monday and Tuesday are the final days for tickets and sponsorships with MarylandReporter.com’s happy hour fundraiser at 6 p.m. Tuesday night, Nov. 29, with Gov. Larry Hogan and Comptroller Peter Franchot as guest bartenders. No political speeches. Just food, drink and schmoozing. Click here to sponsor or attend or just contribute. TRY LISTENING TO TRUMP SUPPORTERS: With so much outrage and wailing about the Trump victory — and plenty of nasty pushback on social media from some Trump supporters — this N.Y. Times column by David Brooks brought a dose of his usual balanced good sense to all the irrational aftermath. He suggests that Trump critics, like himself, try a little listening. CITY HALL TRANSITION: WYPR’s Fraser Smith and Kenneth Burns, WYPR’s City Hall reporter, discuss the transition in Baltimore City from Mayor Stephanie Rawlings-Blake to Mayor-elect Catherine Pugh. WHAT’S NEXT FOR SRB: Yvonne Wenger of the Sun writes that Baltimore City Mayor Stephanie Rawlings-Blake will join a professional speakers group and fight to keep her leadership position in the national Democratic Party when she leaves elected office next month for the first time in her adult life. Missing from her to-do list: running for office again. The 46-year-old mayor — who became the youngest person ever elected to the City Council in 1995 — said she has no plans to run for any elected position, though she did not rule out changing her mind. PUGH INAUGURATION: The Sun is reporting that Baltimore City Mayor-elect Catherine E. Pugh released a schedule of Baltimore Inauguration Day events Wednesday. They include four community receptions across the city and a $100-a-head party at a downtown hotel. Pugh, a Democrat, will be sworn in as Baltimore’s 50th mayor on Dec. 6. LOYOLA APOLOGIZES FOR PATRIOTIC PARTY: On the morning before an annual celebration for the senior class at Loyola University Maryland, student leaders apologized for this year’s theme: “Party in the USA.” “As an organization, we want to extend our deepest apologies to those that were hurt by this theme and the negative impact it had on them,” an email from the student government association to the Class of 2017 read. Some students were shocked that a patriotic party could be considered “divisive,” and that an administrator had advised student leaders to reconsider it after the presidential election, Susan Svrluga writes in the Post. GEN. FRETTERD DIES: Lt. Gen. James F. Fretterd, who headed the Maryland National Guard for 16 years and helped increase the number of women and minorities in the officer ranks, died Saturday of kidney failure at his home in Federalsburg on the Eastern Shore. He was 86, reports Carrie Wells in the Sun.